This VGA cable is a perfect choice for directly connecting a high-resolution monitor or projector to a laptop or desktop in an office or conference room. High-purity oxygen-free-copper core wires offer exceptional picture quality with no fuzzy images, giving you fluent and clear visual experience. 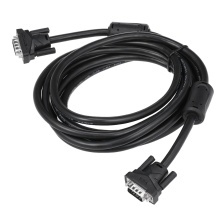 High-performance VGA cable connects a VGA equipped computer to a monitor or projector with 15-pin VGA port. Resolution up to 1080p, bringing full-color images, clear quality and excellent visual experience. Aluminum foil and 3+6 double magnetic rings design succeed in anti-interference and suppressing noise, making transmission more stable and clear. Dust cover design prevents the plug from dust or water, extending its service life. Three options with various lengths, including 1.5m/3.0m/5m.